Ned Lamont and his running mate, Susan Bysiewicz. Connecticut’s gubernatorial ad wars got personal Tuesday as Democrat Ned Lamont asked Republican Bob Stefanowski to stop airing a television commercial that Lamont says falsely implicates his wife, venture capitalist Annie Lamont, in profiting from a British payday lender, Wonga. The ad was a rebuttal to a commercial Lamont aired attacking Stefanowski over his role as the chief executive officer of DFC Global, also a payday lender. It focused on fraudulent auto loans a DFC affiliate made to U.S. military personnel, creating the false impression Stefanowski was at the company when the service members were gouged with hidden fees. Without admitting wrongdoing, the company made $3.3 million in refunds to customers in a settlement with the Consumer Financial Protection Bureau in 2013, a year before Stefanowski arrived as chief executive of DFC. The company did continue to provide high-interest, short-term loans under Stefanowski that are illegal in Connecticut and a dozen other states and are considered by consumer advocates to be predatory. Kendall Marr, a spokesman for Stefanowski, said Lamont should focus on the accuracy of his own ads, adding that the Democrat currently has a “huge buy that attempts to frame Bob for things” that occurred before joining DFC Global and a previous job at UBS Investment Bank. The Stefanowski ad doesn’t mention Annie Lamont by name, but his campaign acknowledges the premise for the spot is based on an investment in Wonga made by her firm, Oak Investment Partners, in 2011. The investment was not part of her portfolio, according to Oak’s web site and Ned Lamont. “Annie certainly had nothing to do with it. Leave my wife out of it,” Lamont said. 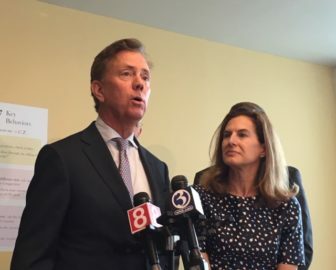 He spoke at a press conference Tuesday afternoon at a community health center in Hartford, where Lamont and his running mate, Susan Bysiewicz, took issue with Stefanowski’s statement during a debate that Connecticut did not benefit from the Affordable Care Act. The Stefanowski campaign has no evidence to support that assertion. For one thing, Wonga has gone out of business, and it appears no one profited from their investment in the British startup, including Oak. In defending the new ad, Stefanowski’s campaign essentially has taken the position Lamont can be held responsible for any investment made by his wife while a managing partner at Oak Investment, or the new fund she co-founded in 2014 that focuses on health care and financial technology, Oak HC/FT. Stefanowski’s campaign also questioned if Ned Lamont had a direct relationship with Oak, noting that three contributions to campaigns of U.S. Rep. Rosa L. DeLauro listed Oak as his employer. Dozens of other contributions Lamont made over the years list his employer as his own company, a small cable-television company he no longer owns. Lamont said the DeLauro campaign reports are wrong; he never has worked for Oak. Stefanowski and Lamont are self-funding their campaigns to varying degrees. Stefanowski had loaned or contributed $2.6 million of his own money to the campaign’s total receipts of $3.5 million through the end of August, but he says contributions have dramatically increased since he won the GOP primary in August. The next campaign finance report is due Oct. 10. Lamont, who spent $26 million of his money on previous campaigns for U.S. Senate in 2006 and governor in 2010, had provided $3.9 million of his campaign’s total receipts of $4.29 million, according to reports in August. He says he will spend millions more. Stefanowski’s net worth is unknown, and he has not yet released his taxes. Lamont, who released his taxes in 2006, said he would do so again if Stefanowski did the same. His campaign now says he will release them either way. Stefanowski’s campaign says he will release either his returns or a summary of his tax filings soon. Financial disclosure forms filed in 2006 as part of Lamont’s Senate race showed the candidate and his wife with a net worth of between $90 million and $332 million; between $54 million and $193 million of that money was attributed to Annie Lamont. Ned Lamont is from a wealthy family. His great-grandfather, Thomas W. Lamont, was the chairman of J.P. Morgan. His grandfather, Thomas S. Lamont, was a partner at Morgan Guaranty Trust.